A Berkeley company may have made the coolest thing for paraplegics since the wheelchair. eLEGS, created by Berkeley Bionics, is an exoskeleton with artificial intelligence that helps people stand up and walk. Users wear a backpack with a computer connected to motors on the knee and hip. Crutches are used for support and also send movement signals to the legs. “A real-time computer draws on sensors and input devices to orchestrate every aspect of a single stride,” according to its website. 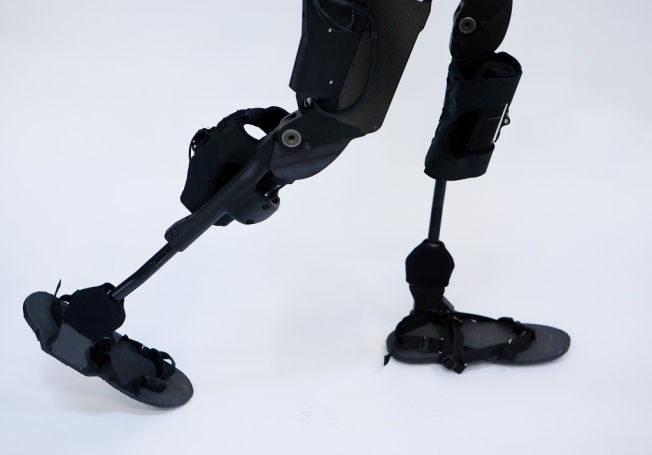 The bionic device is made of carbon fiber and steel and runs on lithium-ion batteries. It fits over clothing and shoes. Weighing in at 45 pounds, the legs allow someone to walk up to two miles per hour for six hours in a clinical situation. Berkeley Bionics also created the Human Universal Load Carrier in 2008, which is being developed by Lockheed Martin for future military use. The company's CEO, Eythor Bender, appeared on national television Wednesday demonstrating the legs. He said his goal is to eventually make them available for anyone to take home. They aren’t available to the public yet, but clinical trials are scheduled for 2011 at select rehabilitation centers in the U.S.